I know I've had my blog a little abandoned, but it's been 2 months since I don't have a computer. I have only been able to use my Dad's computer, boyfriend's or my job's computer when I have a chance. Thus it's quite difficult to blog. So I guess today I will show you a few things I've bought. I bought the black ballerina flats I've been wanting for a while. They look so chic, I have gotten complements on them. They really look like pointe shoes! The only thing I don't like so much is that they don't have a lot of cushion, so I can't really use them to go out on a long walk. Lately I've been having a love and hate relationship with Forever21, more of hate to be honest. It used to be my one stop shop because I could always find something pretty there. But lately I hate their stuff. It's like their clothes are for a female version of G-Dragon. You know, lots of black, with studs, spikes, bright colors, the "SWAG" and "West Coast" shirts. Not really something I like to wear myself. I did find a few things online though, but I had to dig through the website. I found this pullover for only $10. I like the bows in the back. Also found this overall dress. I see this kind of dress is really popular in the Japanese magazines this fall. Apparently black and white is big for this season. Also on found this jewellery box for only $5. It's super bad quality though. It's very fragile, and who ever painted it did a not so good job. I'm really liking the preppy look right now. I think it looks more mature, classy but still has a bit of cuteness. I'm especially liking outfits like this. I had not realized this, but Halloween is only a few days ago, and I have not bought my costume. 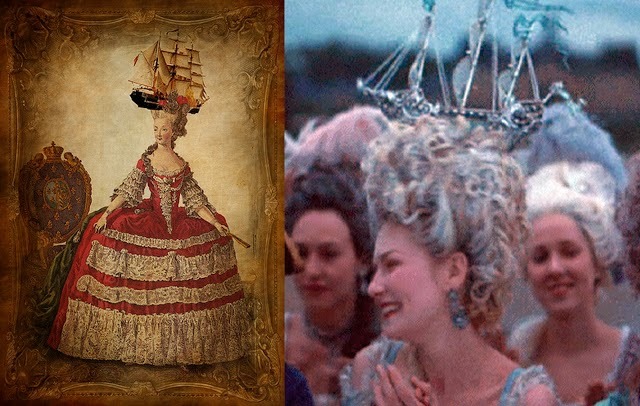 I decided I'm going to be Marie Antoinette. Since watching the movie I had been wanting to dress up as Marie Antoinette for a while, but for some reason I never bought the costume. 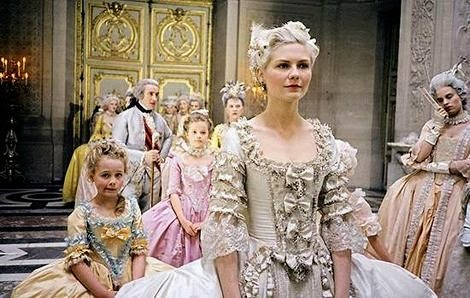 Kirsten Dunst in "Marie Antoinette"
So looking online I found this website Trashy. They have the most gorgeous costumes ever! Like can I wear this everyday? Too bad they are around $300 each. I've also been thinking if I should buy the white wig because it really completes the costume. 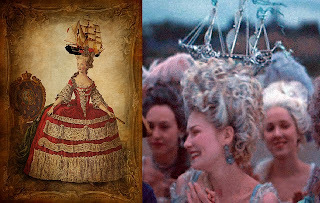 I'm even considering the "hair ship" like Kirsten Dunst had in the movie. It's really over the top, but that's what Marie Antoinette was all about! For part 1, 2, and 3. 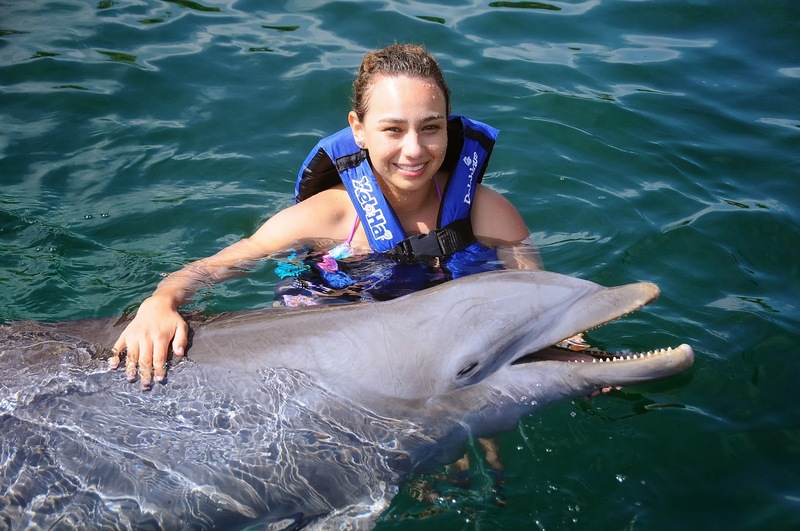 For our fourth day we also booked a tour with the same company, and after two and a half hours we arrived at our destination. 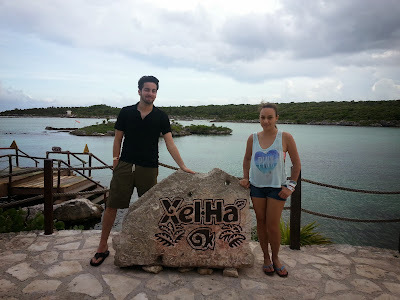 We went to "Xel-ha". This tour was a little more expensive, I think around $107 each, but it included roundtrip transportation, entrance to Xel Ha, and all you can eat and drink in the park, inluding alcohol. Xel-ha means spring water in mayan language. 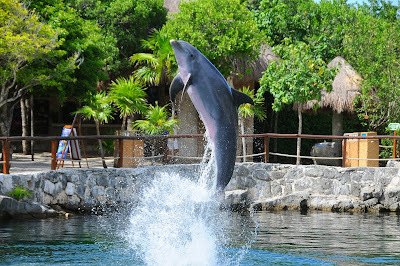 The place is an ecopark, which I would describe it as a mix of Seaworld and a waterpark, but natural. You can snorkel, dive from a cliff, there are zip lines, there is also a cenote on site, ride bikes in the jungle, etc, and everything is included! First thing we did when we arrived we breakfast, and this was the view of the restaurant. Everywhere you look is beyond beautiful. 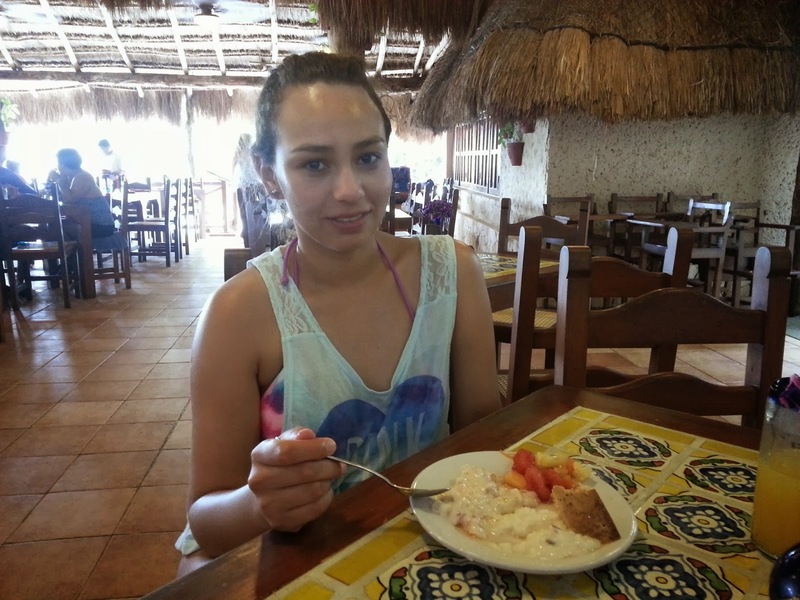 I got so dark while in Cancun, the good thing is that I don't get red like tomato, I just get a tan. After having breakfast we went to get our lockers and snorkel equipment to well do some snorkeling. The waters are crystal clear. 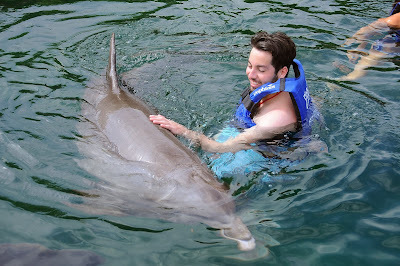 Also it was my first time snorkeling... I know, I'm such a loser. I regret not taking many pictures. My waterproof camera uses AA batteries, and I had 2 extra spares with me, and I charged them before leaving but when I put them on the camera the camera wouldn't turn on. I had to buy oldschool alkaline batteries and was I afraid of using the camera too much because it would drain the batteries out. We could've spent the entire day snorkeling here there are so many colorful fishes. I don't know were did the time go because after this we went back to drop off our snorkeling equipment, and then to the box office to purchase tickets for an optional activity. We walked around a little bit, ate a bit, and rest a bit. 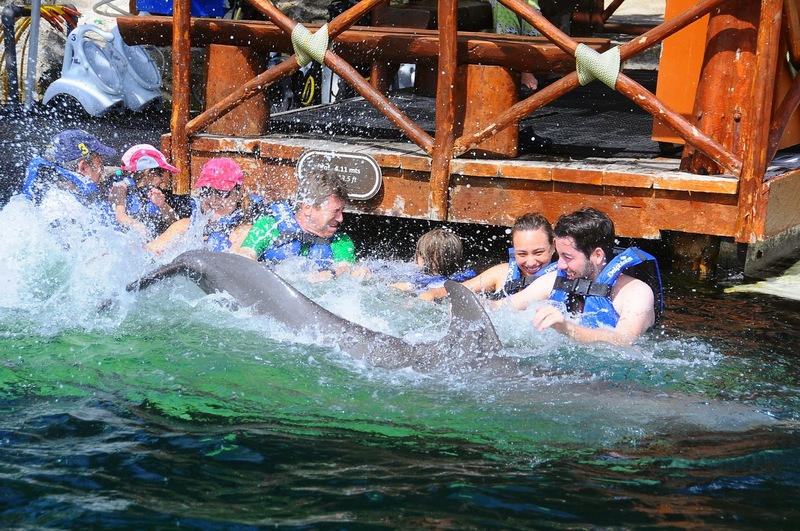 The dolphin swim took up most of our afternoon because they take you to a room, show a video, give instructions, wait until the dolphins are ready, then everyone takes the photos, and then they sell you the pictures. We just had enough time left to shower and eat until they picked up up. Sadly the day came to an end. I loved the place. It got cloudy by the end of the day, there was a storm coming, so the water was not as turquoise as it was in the morning. Once they dropped us off at the hotel we went to a little mall to buy souvenirs for the parents. Then we went clubbing. The biggest club there is "Coco Bongo" but my boyfriend didn't want to go there because it's a copy of Las Vegas clubbing scene. You know they have shows and impersonators, that week they had a Michael Jackson impersonator. So we went to the Mandala club instead. The night we arrived this place was packed, but since we went on a Tuesday night it's was rather empty. Like in all the clubs in Cancun, it's open bar, and can you believe they close until 5 AM!?!?! It's crazy, we left until 4. I had never stayed that late partying. Now that is fall (at least in the northern hemisphere) you know what it means. It's colder out there and therefore you need some cozy clothes in your wardrobe. One of my most favorite fall staples are cable knit sweaters. Why? because they go well with everything. You can dress them up and down. Most of the times they come in fall colors like burgundy, olive, navy, etc. But the guys from Oasap have this adorable violet sweater. You can get the sweater here. It's also available in beige and orange and it's only $30. I love that the sweater is not too thick and warm because it means I can also use it during spring, which will be so appropriate for that season. I put together a pastel-esque outfit with warmer clothes for a more chilly weather. My mom said she likes the sweater and it's rare to come across a lovely lavender sweater. It's so true! I always have so much trouble finding lavender clothes, I'm so thankful to Oasap for sending me an incredibly lovely sweater. If you want to buy the sweater hurry! Oasap is having a 20% off sale if you use the code climax-oasap at checkout, and as usual they offer free shipping on all their orders!